Plot synopsis: Surpasses anything filmed before !!! 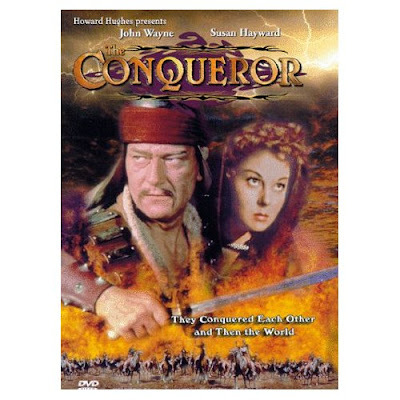 Very coincidentally after "Mongol" a friend gave me his DVD of this movie. And I've just watched it. What can I say ??? Actually my girlfriend summed it up fairly well. "Whats this Crap???" Is that really fair? Whatever, it's immaterial because I want to tell you all about it. I think its very easy in this day and age to be revisionist and say its crap because of the era when it was made, but that's letting it off too easy! Even by the standard of its time (1956) and comparing to other similar movies from that year (War and Peace, The Ten Commandments, Richard III, The King & I), this was a very bad idea from day one! If you close your eyes and think of who could have played Genghis Khan, the one name you wouldn't think of is John Wayne. But, some producer or director did then, and now its part of film history. Lucky us. The Duke probably wasn't the first choice but he did have reasonable star power (then), to be considered for the role. These days an actor would be picked for his suitability for the role or selected on whether he is marketable or not - or both. And what of the Duke's performance??? Only one word comes to mind. Bad. It's damn hilarious to hear the words coming out of his mouth. Here's just a couple to be amazed with. "For good or ill-she is my destiny" & "She is woman - much woman. Should her perfidy be less than that of other women?" Everything else about this movie is pretty much crap as well. The tired, boring music, the obvious studio sets, the bad costumes just to name a few! Would it surprise you to learn that this turkey appears in the top 50 worst movies of all time ??? Ah sooo. But no oriental since has been portrayed with such a drawl. I kept expecting him to call somebody 'pilgrim'. Worth a look once if you are into bad (and I mean bad not good) films.